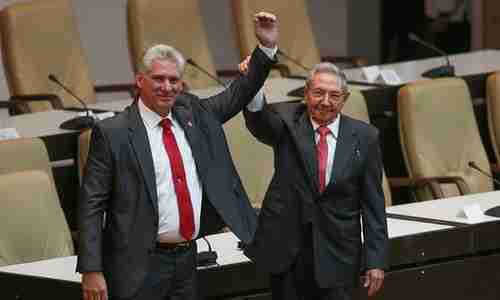 Miguel Mario Díaz-Canel Bermúdez assumed the dictatorship of Cuba on Thursday, as hand-picked successor to 86-year-old Raúl Castro, who is stepping down. Raúl Castro was the hand-picked successor to Fidel Castro when the latter stepped down in 2008. "In Cuba there is no space for those who aspire for a restoration of capitalism. The mandate given by the people to this house is to give continuity to the Cuban revolution in a crucial historic moment. “I assume this responsibility with the conviction that all we revolutionaries, from any trench, will be faithful to Fidel and Raúl, the current leader of the revolutionary process. We will have to exercise an increasingly collective leadership. Strengthening the participation of the people. I do not come to promise anything, as the Revolution never has in all these years. I come to fulfill the program that we have implemented with the guidelines of Socialism and the Revolution. To those who through ignorance or bad faith doubt our commitment, we must tell them that the Revolution continues and will continue. The world has received the wrong message that the Revolution ends with its guerrillas." Díaz-Canel was born in 1960, the year of the Cuban revolution. 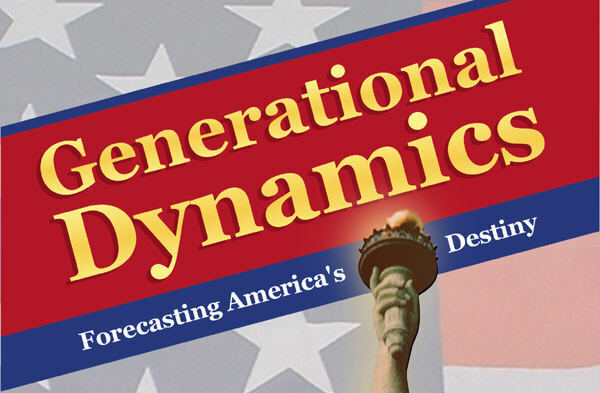 From the point of view of Generational Dynamics, he is in the same generational class as America's Boomers born in 1945 (at the end of World War II). He will not have anything like the revolutionary fervor of the Castros, but will be more likely to seek compromise and avoid conflict. On the other hand, he undoubtedly thinks that the Castros' generation made some mistakes. It remains to be seen what will happen, but it's possible that he may consider one of those mistakes to be the unending hostility to the Cuban community in Florida. News commentators are saying that the retirement of Raúl Castro is the most important event in Cuba's recent history. Others say that the most important moment was president Barack Obama's opening to Cuba in 2014. Others say that the most important moment occurred in 2008, when Fidel Castro stepped down. Well, in my opinion the most important moment in Cuba's recent history occurred in 2010, when Cuba's economy was in shambles, and president Raúl Castro announced the end of the Socialist economy. The government would lay off 500,000 government workers (Socialist bureaucrats) and privatize many businesses. Cuba faces the urgent need to move forward economically, better organize production, enhance productivity and raise reserves, improve discipline and efficiency and this is only possible through the dignified and devoted to our people. Today, the duty of the Cubans is to work and do it well, with seriousness and responsibility, and to make better use of resources available to better serve our needs. In order to update the economic model and economic projects for the 2011-2015 period, the guidelines call for the reduction of more than 500,000 workers in the public sector and in parallel the increase in non-state sector. Our state neither can nor should continue to burden companies and productive organizations with services and inflated budgets that weigh down the economy, are counterproductive, create bad habits and distort the behavior of workers. It is necessary to increase production and quality of services, reduce social spending and eliminate bulky improper gratuities, excessive subsidies. Hundreds of thousands of workers will move to self-employment in the coming years. Within the state sector, it will only be possible to go to places with a historical workforce deficit, such as agriculture, construction, teachers, police, industrial workers and others. A matter of singular importance is the salary. We must reinvigorate the socialist principle of distribution, to pay to each according to the quantity and quality of work provided. The unity of the Cuban workers and our people has been key to maximizing the gigantic edifice built by the Revolution and the changes that we are now undertaking she will continue to be our most important strategic weapon." There's one part of this statement that I didn't sufficiently highlight when I first quoted it. Marx's Socialist Principle Of Distribution is "From each according to abilities, to each according to needs." This means that greedy capitalists are not allowed to make more money than they need at the expense of starving workers. "A matter of singular importance is the salary. We must reinvigorate the socialist principle of distribution, to pay to each according to the quantity and quality of work provided." In this case, "reinvigorate" means "abandon the core principle of Socialism." Cuba may still call itself Socialist, but as a matter of definition it's more Fascist than Socialist. This is not a surprise. Socialism has a 100% failure record, and I've posted the reason many times. As I've written many times in the past, Socialism is mathematically impossible as population grows. The number of regulators grows exponentially faster than the population grows, so by the time you get to, say, a million people, everyone would have to be a regulator. When you impose Socialism on an existing wealthy population, as was done in Venezuela, and what Bernie Sanders would like to do to the US, then it works ok until, as Margaret Thatcher would say, the government runs out of other people's money. Then disaster ensues. This is for the same reason. If the population has more than a few hundred thousand people, then there aren't enough government regulators. A country can save itself from that disaster by retrenching from Socialism as Cuba and even Russia have done. Sweden also did this, adopting Socialism in the 1970s, and abandoning it in the 1990s. North Korea and Venezuela are the disaster that happens when the country leaders refuse to retrench. Socialism is the greatest economic disaster in world history. It's much worse than Naziism or Fascism. The Nazis may have killed tens of millions of people, but in the last century, Socialism has killed hundreds of millions of people. Socialism has never succeeded, for the reasons I've given. Socialism has a 100% failure rate, for the reasons I've given. There is literally nothing worse than Socialism. As in Venezuela, Socialism has been extremely destructive to Cuba's economy. There is one unique thing about Cuba's economy, however. Ever since the Cuban revolution in 1960, Cuba has been depending on other Socialist countries to provide money to prop up its economy. For decades, the Soviet Union supplied that money. When the Soviet Union collapsed in 1991, Cuba's economy tanked. The Venezuela started providing money to Cuba, and Cuba was OK again. For two decades, Venezuela provided $6 billion per year to Cuba. But Venezuela's Socialist economy has been suffering its own catastrophic collapse in the last few years, and can no longer subsidize Cuba. Cuba is said to be searching for another country to provide free money, and they're talking to Russia and China. But Russia and China have their own economic problems, and they're also being asked to prop up Venezuela's failing Socialist economy. Cuba could be helped in another way, if international investors were willing to invest in businesses in Cuba. However, investors would have to know that they will be allowed to extract their money in later years, which would require reforms to the banking system. Cuba would also have to do away with its "dual currency system" before investors would be interested. The new president, Miguel Mario Díaz-Canel Bermúdez, has promised to reform the dual currency system, but that is strongly opposed by Cuba's élite class. The bizarre dual currency system means that Cuba has two currencies -- Cuban peso (CUP) and the Cuban convertible peso (CUC). The CUC is pegged to the dollar, while the CUP worth 1/25th of a CUC. As one example, Cuba's peasants get paid in the cheap CUP currency, but the élites with government connections receive huge subsidies by converting their cheap CUPs for expensive CUCs. Díaz-Canel has said that he would do away with dual currencies, but other problems run deep in the economy. Despite the 2010 reforms, the government still employs three of every four Cuban workers, and they are mostly bureaucrats who produce little or nothing. The average monthly state salary is $31 — so low that workers often live on stolen goods and handouts from relatives overseas, according to reports.